In the Catalan countryside surrounding Barcelona, young, sweet onions break ground in mid-winter, growing tall and pale in the rich Mediterranean soil packed around their roots. The fertile earth guards the tender white shoots from the sun, leaving them delicate, delicious, and ready for grilling. 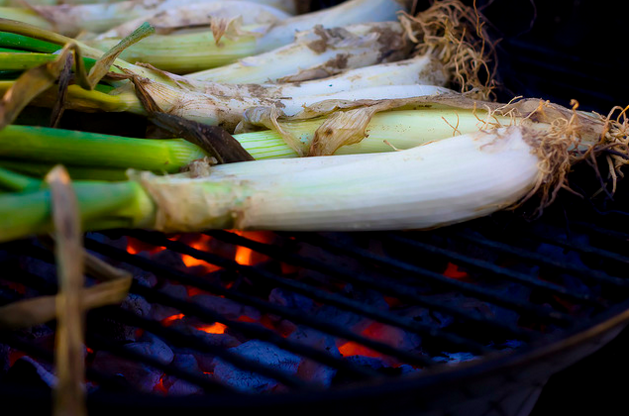 The calçotada (a calçot feast) begins with bundles of young spring onions charred black on a smoky, sweet hay-fuel grill. Once grilled, the long stalks (about 1’ in length) are wrapped in newspaper to steam tender for some 20 minutes, then released from their tight bundles. The onions are most commonly served to each participant on a traditional clay roofing tile to help retain their heat. Though the appeal of a calçotada is a delicious, affordable meal of truly epic proportion, the fun of the festa is found in the quirky manner in which the calçots must be consumed. With bold fingertips, one must strip the charred outer layer of the calçot away to reveal the nearly-melting inner core. The juicy stalk is dipped in one’s personal crock of salsa romesco (roasted tomato, onion, garlic, and almond puree), then dangled high above one’s head and lowered into an open mouth with gusto and devoured in one savory bite. Not surprisingly, a calçotada menu price often includes a gigantic bib that reaches from the neck to the knees, shielding one’s clothing from sauce, oil, and the rivers of wine that shoot from the communal glass pitchers—or porró— flowing down from above into thirsty mouths. The best of the best hold the porró at arm’s length and imbibe the perfect, arching, ruby stream without spilling a drop. 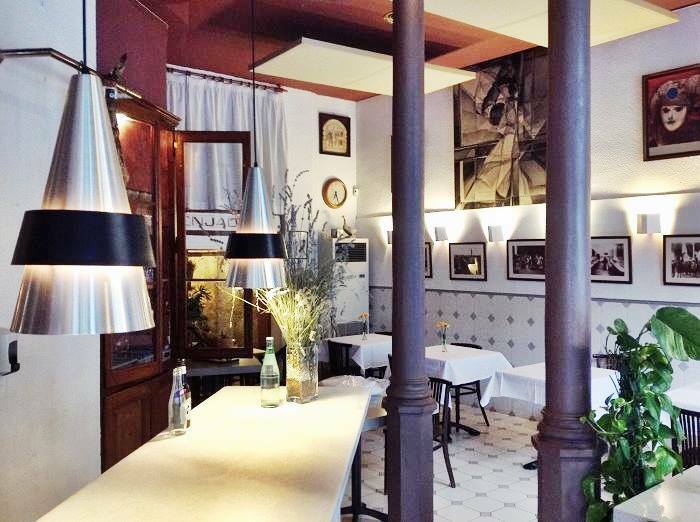 Just 250 meters from Barcelona’s famous Parc Güell and with some of the best panoramic views of any restaurant in Barcelona, El Jardí de l’Àpat is a true Catalan classic. They offer special menus all year round, from Christmas and New Year’s Eve to the summer barbecues and birthday celebrations, with grilled meats and snails being star dishes. However, their real specialty is the calçotada! With the help of a real wood-fire, L’Antic Forn (the old oven) roasts up delicious calçots every winter and spring in the heart of Barcelona center. On a quiet street in El Raval, this old-fashioned restaurant is the perfect place to delve into the world of authentic Catalan cuisine. The menu offers an excellent selection of grilled meats, fish, and seafood, and plenty of traditional starters like stewed baby octopus in onions and “Espinacs a la catalans” (sautéed spinach with raisins and pine nuts). All year round you can find good, honest food at this neighborhood favorite, though the best is between January and April when calçots grace nearly every table. Founded in 1987, Can Martí is the best of both worlds: a countryside feel within the Barcelona city limits. Perched in the green hills above the neighborhood of Sarrià, Can Martí offers daily lunch menus, a space for special celebrations, and even a “cyclist breakfast” of cured meats, sausages, Spanish omelettes, cheeses, and pa amb tomàquet (tomato bread) for the many who choose to spend their mornings pedaling steadily up into the Collserola Park. For the calçot lovers, Can Martí offers two menu options, one slightly larger than the other. Do like the locals and hike up to this rustic restaurant and spend an entire Sunday enjoying the scenic setting. The name of this charming little restaurant literally translates to “the hearth,” and it’s a perfect moniker. Located in the center of Barcelona’s character-rich neighborhood of Gràcia, everything from the wood-fired grill and chalkboard menus to the classic red-checkered tablecloths and farmhouse decor lets you know right from the start that an authentic meal is in store. Specializing in grilled meats, salads, and torradas (open-faced Catalan sandwiches on dense, crispy slices of toasted peasant bread), every winter La Llar de Foc rolls out the romesco and treats life-long customers to true calçot feasts—there’s nothing quite like fire-roasted calçots with plenty of red wine to wash them down! Because of the restaurant’s ideal location, a long stroll through the streets and plaças of Gràcia after your massive meal is virtually obligatory. That said, if you’re keen for someone to expertly guide you along the way, taking you to the best Calçotada’s on this side of the Atlantic, then don’t hesitate to contact us. 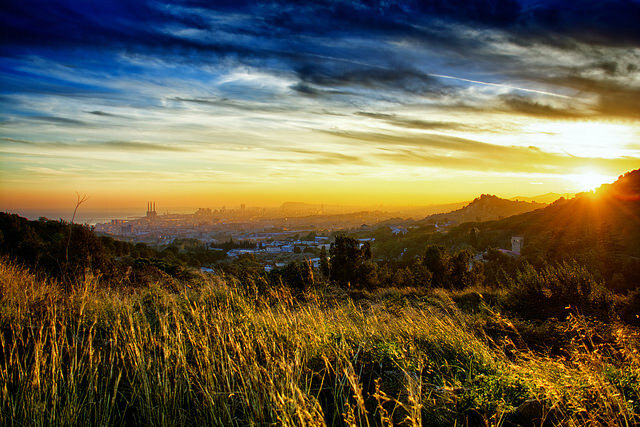 We’d love nothing more than to make you feel at home and your stomach at ease on a customized foodie tour of Barcelona!